Crystal skulls | Explorations in Spirit with Dr. Joseph Mancini, Jr. In various New Age and crystal stores, both brick-and-mortar and online, and elsewhere on the Internet, including Ebay, you may have seen skulls made of rock quartz and other stones, ranging from amethyst and citrine to charoite and ruby zoisite. Some are only a half-inch in length (back of head to leading edge of chin) and weigh just a few grams, while others may be as large as 10” and weigh 20 lbs or so. In rare instances, even larger, “Titan” skulls are offered, one nearly 17” long and just over 145 lbs. Just what are these crystal skulls, which elicit varying reactions from observers, from disgust and even horror to fascination and even appreciation bordering on reverence? In short, they are divination, transformation and healing instruments, new to many, yet presumably familiar to the ancients. Some devotees believe the crystals skulls were major spiritual tools for Atlantis and other past civilizations; and they are surely used in rituals performed even now by Mayan shamans, some Native American medicine men and women, and Buddhist Red Hats in Tibetan Monasteries. “So why are these stones in the shape of skulls?” is usually the first question I have to answer when I introduce them. The questioner often feels either queasy and/or fearful of what in the collective consciousness is simply a symbol of the macabre, of decay and death. Yet, the skull image serves several important functions when these stones are used with spiritual intention. First, since communication with the crystal skulls is a primary way of interacting with them, the skull face offers the image of a personality, a more familiar interface than a mere smooth or convoluted surface. Second, just as when we look into the eyes of a fellow human, when we likewise look into the eye sockets of a crystal skull, we can more easily sense having access to deeper truths. In fact, most psychics who interact in this way particularly with translucent skulls start to observe static and moving pictures behind the eye sockets. Third, the skull image reminds the observer who seeks wisdom that we usually associate knowledge with the head or brain; not surprisingly, many crystal skulls, especially those made of quartz, are assumed to be repositories of ancient knowledge waiting to be unlocked for the good of humanity. Fourth, as Jaap van Etten, one of the best crystal skull researchers, notes on his website, http://www.lemurantis.com, the skull shape reminds us that we use the brain also to focus into three-dimensional reality and to translate into a useable form what we get from Spirit. Fifth, what we get from Spirit often comes from the crown and third eye chakras, which are also represented by the skull; thus, there is an emphasis on using crystal skulls as portals or bridges to intuitive knowledge, which is then interpreted by the brain. Sixth, especially when the crystal skull is one of those rare “singing skulls,” i.e., one with an open mouth or detachable jaw, the throat chakra is also implied, suggesting that the skull has something to convey to those who can listen. Seventh, although the skull image certainly points to death, it also points to immortality. Many of the stones, including quartz, that are carved into skulls are millions of years old. Some others like Nuumite (found only in Greenland as part of the earth’s primordial crust), and Stromatolite and Crinoid Fossil (both from fossilized primordial creatures) are several billion years old. We are thereby reminded that the essense of the human is immortality literally in the “face” of death. Eighth, the skull image is a symbol of the essential human in another way: its flesh-less state does not distract the viewer with skin color and other ethnic features that, very unfortunately, sometimes alienate. Yet, ironically, the immense and even intense “skin” beauty of the stones themselves, with all their different carving styles, flowing and static patterns, and swirls of interacting colors and luminescences, seduce the observer into interaction with them. And, again like every human, each crystal skull is unique in its patterning and coloration while sharing a common morphic field. Ninth, the fact that the image of the human skull is carved in often very hard (many register 5-8 on the Mohs hardness scale), enduring stone suggests both a passing over to another world while also being rooted to Mother Earth, glorious in her variegated color. This combination of opposites suggests two more metaphors/functions of the skull image: the crystal skull is thereby an image of Heaven on Earth, and also an interface, an intermediary, a portal between the two worlds. Finally, according to Jaap van Etten in the best basic book on crystal skulls, Crystal Skulls: Expand Your Consciousness, sculptors of crystal skulls in Brazil have told him that they experience a consciousness shift as soon as they carve the eye sockets of the skull image. In his own research, Van Etten has confirmed that crystal skulls, just because they display the skull image, have a frequency that is addition to the natural one of the stones that are carved. And some believe that these “new frequencies are in the range of human thought” (www.angelslove.net), an indication, if true, that the skull image opens up a range of energy that is most useful to humans. Before discussing how to work with these spiritual tools, I want to provide some context, depicting some of the important issues and controversies associated with crystal skulls, including problems with classification (difficulties in authenticating truly ancient crystal skulls, especially the Mitchell-Hedges Skull), and the mysterious Legend of the Thirteen Crystal Skulls. Back in the 1980s, the late F. R. “Nick” Nocerino, one of the foremost crystal skull researchers and co-author of the 1989 book, Mysteries of the Crystal Skulls Revealed, setup up a classification system for crystal skulls based on their presumed ages: skulls were “contemporary” if they were less than 100 years old, “old” if they were considered carved between 100 to 1500 years before now, and “ancient” if they were carved more than 1500 years ago. The age of a crystal skull is important because the older the carving is, the more valuable and rare it is, and the more likely it is associated with older civilizations and their wisdom. The problem is that the stones of most crystal skulls, particularly quartz, cannot be carbon-dated, nor can the carvings themselves. Thus researchers depend on electron-microscope examinations of marks left by carving tools. If the marks are parallel lines, it is assumed that the carving took place within the last 100-150 years; if the marks are uneven or non-existent, the carvings are deemed much older because the assumption is that the ancients had nothing like modern carving tools. This kind of reasoning, however, is questionable; for it assumes that technology pursues a linear development. Yet, some ancient civilizations, like the ones that built the Giza pyramids and Puma Punku in Bolivia, were capable of feats that defy the abilities of modern engineers. Choosing to bypass this controversy, van Etten proposes that skulls be classified according to how many energy layers (up to 32) have been activated in any one particular skull, noting that the most ancient, like the famous Mitchell-Hedges Skull, have the most activated layers; there is no known energetic way today to activate that many layers. Nevertheless, this system is not full-proof because, as van Etten notes, some skulls that may in fact be ancient may have been carved in places where no one knew how to activate them or where such activation was not considered necessary. The most famous, most beautiful, most anatomically correct, and possibly most ancient crystal skull of all, the Mitchell-Hedges Skull (MHS), whose present caretaker is Bill Homann, is no stranger to controversy about its origin and the age of its carving. In 1924 on the day of her 17th birthday, Anna Mitchell Hedges, the adopted daughter of adventurer and archeologist, F.A. Mitchell-Hedges, allegedly found the top part of this amazingly clear skull and, three months later, its detachable jaw at the bottom of a hitherto unknown, Maya pyramidal structure in Lubaantún, Belize. Although Anna affirmed the veracity of the tale to the day of her death in 2007, that story has been questioned many times, even by crystal skull researchers F. R. “Nick” Nocerino and Stephen Mehler, the latter co-author of The Crystal Skulls: Astonishing Portals to Man’s Past. In 1970, art conservator and biocrystallographer, Frank Dorland, author of Holy Ice: Bridge to the Subconscious, was allowed to bring MHS to the Hewlett Packard Laboratories in California for testing. While two other crystal skulls—the Paris Skull and the British Museum Skull, that were tested along with MHS at the lab—were declared fake ancient crystal skulls, MHS was declared a mystery. In 1986, Dorland noted that a forensic team made a facial reconstruction from the skull and concluded that it represented a Mongoloid female who died when she was between 25 and 29 years old. Despite these intriguing discoveries, in 2010, Jane Walsh of the Smithsonian Institute determined that, through electron microscopy, lapidary tool marks were found on the skull that supposedly disqualified MHS from the status of ancient crystal skull. Still, even this information is inconclusive, given the prejudicial view I mentioned above that such marks could be made only by modern tools. Moreover, MHS defies modern creation in other ways. First of all, the Hewlett Packard technicians determined that the part of MHS that was to be the jaw was cut loose from the rest of the skull and then shaped in perfect alignment with the stress lines of the main part of the skull—an absolutely amazing lapidary feat! Furthermore, according to Dorland, and later Mehler and Childress, in the roof of the mouth of MHS is an extraordinary prism surface; it was astoundingly carved so that light coming from the bottom of the skull through formulated light wells or “pipes” and hitting the prism would be reflected into the cranium and also out through the eye sockets. This phenomenon, along with the movable jaw, suggests the skull may have been used as an oracle by an older civilization. Finally, as archeologists Mehler and Childress note, the carving was made across the natural crystal axis—the quartz should have shattered if carved with modern, high-vibration tools. One more point here: Mehler and Childress’s observations about Jane Walsh’s conclusions regarding the testing of other, supposedly ancient crystal skulls cast doubt on her declarations of the age of MHS. 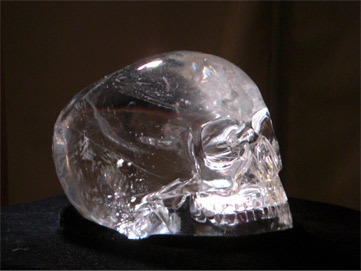 In 1996, as reported by Mehler and Childress, other supposedly ancient crystal skulls, Max (the “Texas Crystal Skull,” used by Mayan priests in Guatemala and later given to a Tibetan Red Hat Lama and then to Jo Ann Parks), Sha Na Ra (found in a Mexican dig by Nocerino using “psychic archeology” and now in the hands of his daughter, Michelle), the British Museum Skull, and a few other skulls were tested at the British Museum using electron microscopy. All the skulls, except for Max and Sha Na Ra, were declared modern; but the staff had no comment about the first two! Yet, Walsh, who was only an overseer of the tests, repeatedly declared for years that all the skulls were modern! Whatever the truth is about the origins of MHS, there is continual speculation about it, including the idea that the skull is the crystallization of the skull of an Atlantean princess! Another idea is that it is one of the legendary thirteen crystal skulls. The basic notion of this legend is that the skulls hold all the information that, if downloaded and decoded, would prove vital to the world’s survival in the advent of a global catastrophe. But the skulls’ knowledge may also further the evolution of the human species as that information is presumed to have done in the very distant past. According to the Legend, the skulls are now either buried or otherwise hidden; only when the Twelve are discovered and brought together with the Thirteenth Skull, the Master One, is such a revelation possible. This legend has been passed down in various forms by some Native American tribes and other groups. One such variation is told by Cherokee Harley SwiftDeer to writers and filmmakers Chris Morton and Ceri Thomas and recorded in their The Mystery of the Crystal Skulls: Unlocking the Secrets of the Past, Present, and Future. According to SwiftDeer, when the Elders of the original twelve planets observed that Earth was not evolving properly, they encoded into twelve, flawless skulls with detachable jaws all the wisdom of the planets and placed them in an Ark on Earth with a thirteenth skull that encoded the consciousness of all the worlds. As extraterrestrials, the Elders brought them to Earth and, hundreds of thousands of years ago, seeded the civilizations of Lemuria, Mu, Atlantis and Mieyhun. The skulls were passed down to the Olmecs, Mayans and Aztecs, the latter abusing the skulls’ power; as a result, when Cortez came, conquered the Aztecs and pursued the skulls, the priests hid them all over the world. Another variant has the skulls’ downloading information from twelve star systems, such as the Pleiades, Sirius, Alpha Centauri and Orion. In his first book, Crystal Skulls: Interacting with a Phenomenon, van Etten notes also that there are physical portals in Sedona and around the globe associated with these skulls, that there may even be fifty-two (4 X 13) crystal skulls, and that the original thirteen may not even be physical, but instead be fields of information/energy. 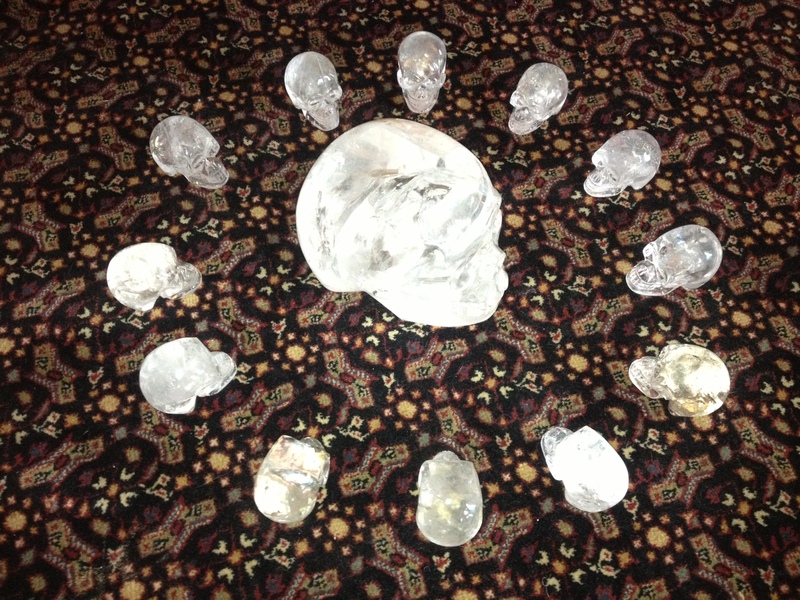 It is not even clear that all the physical manifestations of these possibly ancient skulls are made of clear rock crystal quartz, like MHS, Max, Sha Na Ra, Synergy (whose earthly origination is a tiny village in the Andes and whose current caretaker is Sherry Whitfield), and Einstein (which weighs nearly thirty-three pounds and is under the care of Carolyn Ford). But other skulls that may be ancient are not clear quartz, such as the smoky quartz skull named ET (whose caretaker is Joky va Dieten and was found in Guatemala in 1906, though the Maya allege it came from the Pleiades); Ami, the Amethyst [Quartz] Skull (whose caretaker is now unknown, though its first known appearance was sometime between 1876 and 1910 on the desk of President Diaz of Mexico); the rose quartz skull, Baby Luv (whose caretaker is Joky van Dieten and may date back to 700 BC in Russia); and Amar, the possibly ancient, slightly smokey quartz, Tibetan Skull (used by Tibetan monks for healing and now in the care of the owner of CrystalSkulls.com, one of the best sites for buying skulls). Yet what is important is that all of these skulls and many other, possibly ancient skulls are all quartz, clear or otherwise. Quartz, more than other crystals, reflects, transmits, attunes, focuses, transforms, refracts and amplifies energies. According to van Etten, only quartz skulls can be activated to 36 layers, while some other stones can be activated only to 24, and most only to 12. The more layers activated, the more power the skull has and the greater the energy field around it. Quartz (silicon dioxide) also makes up about 80 % of the Earth and is needed to maintain the health of our bodies. Moreover, its capacity to use mechanical stress to create an electrical voltage (the piezoelectric effect) and vice versa makes it valuable in the mechanical regulation of clocks and computers. In addition, experiments have shown that it is possible to store information in holographic form in quartz crystal, an indication that the belief that some quartz skulls are repositories of ancient wisdom may well be true. Now, with this entire context, this info, my reader might well be eager to become a caretaker of and work with his or her own crystal skull. 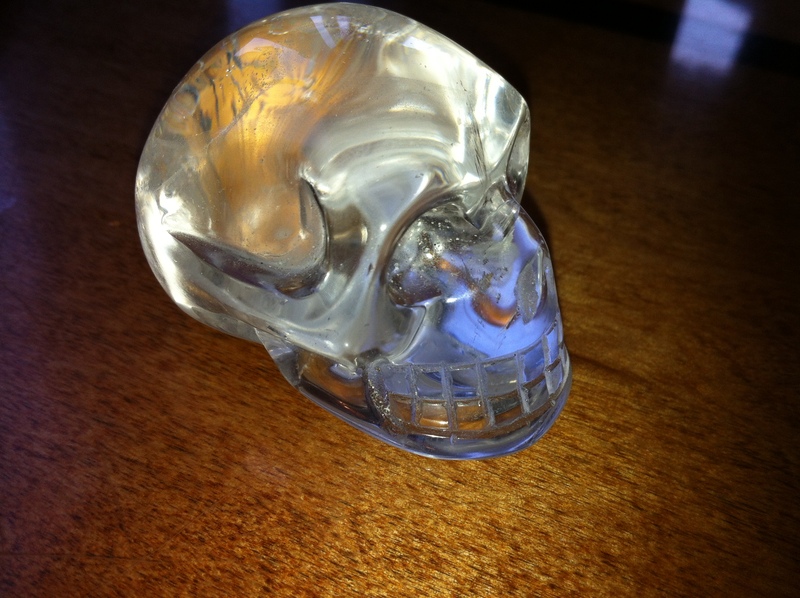 If you are not given a crystal skull as a gift, you can purchase one, usually a contemporary carving. (Beware of deals “too good to be true,” especially if what is offered for sale is purportedly an ancient crystal skull, for these skulls are exceedingly rare; few individuals today know enough about crystal skull frequencies to use that awareness to determine the very high activation level of ancient crystal skulls.) When choosing, use your awareness, your felt sense, of what skull most speaks to you. Your attention to the beauty of the stone, by itself, is usually not enough to determine the best skull for you. Holding it in your hand and near your heart will usually give you enough vibrational information about the suitability of the skull for you. You can also use dowsing, commonly performed by using a pendulum over a particular skull and asking appropriate yes or no questions about its usefulness to you (that is, after you have determined which movements of the pendulum designate yes and no answers). 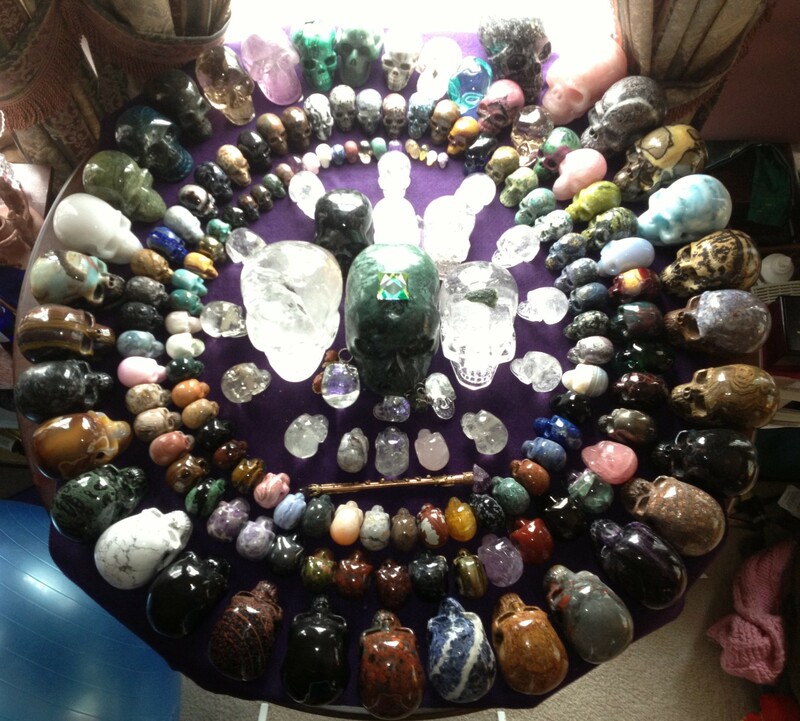 Yet it is possible to choose a skull also by looking at a picture of it online (as at Skullis.com, which is based in Beijing, or CrystalSkulls.com, which is based in Washington State and British Columbia) if you prepare yourself by going into a meditative state and asking help from your Higher Self. However you choose your skull(s), keep in mind that, just as Native Americans see themselves, not as owners of the land they live on, but rather as its stewards, so, too, it is wise and appropriate to see yourself not as an owner of a skull, but rather as the caretaker of this personalized energy form. Once you have become a caretaker of a skull, you need to cleanse it and then activate and program it before using it. To cleanse it, use one or more of the usual methods for cleaning crystals, such as burying it for a time in Mother Earth, setting it in sunlight (being aware that some crystals fade in this light) or moonlight, covering it with “alive” running water (knowing some stones can dissolve in water), immersing it in “alive” salt water (checking first which stones can be damaged by water), exposing it to the energy of cleaned quartz crystals, and/or using ritualized intention. Smudging with sage, sweetgrass, and palo alto will clear any unwanted energies attached to the crystal skull. The same outcome can be achieved through using sound from Tibetan bells or crystal bowls. Activating a crystal skull is the process of turning on its full potential. Skullis.com offers brief, downloadable activation audios by psychic Amazing Grace and DVDs featuring Nick Nocerino. The crystal skulls offered from this site are already activated by the huge, very old crystal skull, Amar. Proximity to and pictures of other ancient skulls may also be useful for activation. Still other modalities may be found online at various crystal skull sites. In his second book, van Etten outlines the process I find most powerful. Essentially, the caretaker goes into a meditative state, fills him/herself with love and then merges with the skull to activate it. He suggests a similar process to program the skull with a clear, simple and unequivocal intention for self- or other-healing or for divination. And, in both activation and programming, van Etten makes an extremely important point not found elsewhere: that, under no circumstances, is the caretaker of a crystal skull to give up any of his or her own power to the skull. This admonition is important because these skulls are very powerful. Researchers and caretakers of many of the skulls already described have reported strange phenomena while near them, like odd smells, cloudy emanations, changes in the skull’s color or clarity, unusual sounds, and changes in the skull’s temperature. Scenes or images from past lives or other venues also have been seen within translucent skulls or through psychometry. Spontaneous physical healings have occurred for several observers, and telepathic communications have been registered, not only by professional psychics like Carole Davis, as recorded in The Skull Speaks, but also by amateur intuitives. For healing self and others, it is best to pair a clear quartz crystal skull with another skull whose specific healing energies are either known or intuited. The quartz skull acts as an amplifier of the other skull’s energies while also transmitting its own. After the healer grounds and protects and clears him/herself of unwanted energy; cleanses, activates and programs both skulls; and asks permission to heal from the subject and his/her Higher Self, the healer might once again fill up with love and gratitude, send that energy into the skull, image the individual to be healed, point the skull’s face towards the location of the person and then image the individual as healed. To heal the self, the same procedure is followed with the exception that the skull is pointed toward oneself or placed upon the exact spot on the body requiring healing. Healing is intensified if several individuals follow this process with their own skulls directed at the person to be healed. For divination purposes, an opaque or translucent skull may be used. After grounding and protecting and cleansing the self, getting permission from those involved, and activating and programming the skulls, the intuitive can use the shamanic technique of “rock divination” with the opaque skulls; this involves asking the intuitive’s Higher self and that of the client to focus the intuitive’s awareness on a particular pattern or part of a pattern on the rock’s surface and then to direct the interpretation, even before the intuitive knows the client’s question. With translucent skulls, the intuitive can look into the skull at various depths and be guided to detect and interpret an interior pattern formed by inclusions, etc. ; or the intuitive may see directly moving or static scenes relevant to the client’s question. Another way to get messages is for the intuitive, after proper preparation, to gaze into the eye sockets of the primary skull, go into a deep trance, and hear/see important telepathic messages. Still another method is to make the usual preparations and then direct the skull, on behalf of the client’s question, to make contact with the crystal skull grid or energy field, to which all skulls are connected and contribute their particular wisdom. A final process is to use the skull, after proper preparations, as a portal to other sources of wisdom, including guides/angels who may be using the skulls to communicate. No matter how you use your skull(s), always remember to have respect, but not abject veneration, for these old and new tools of transformation. Your being in charge with positive intentions ensures that the skulls’ power will be used appropriately. 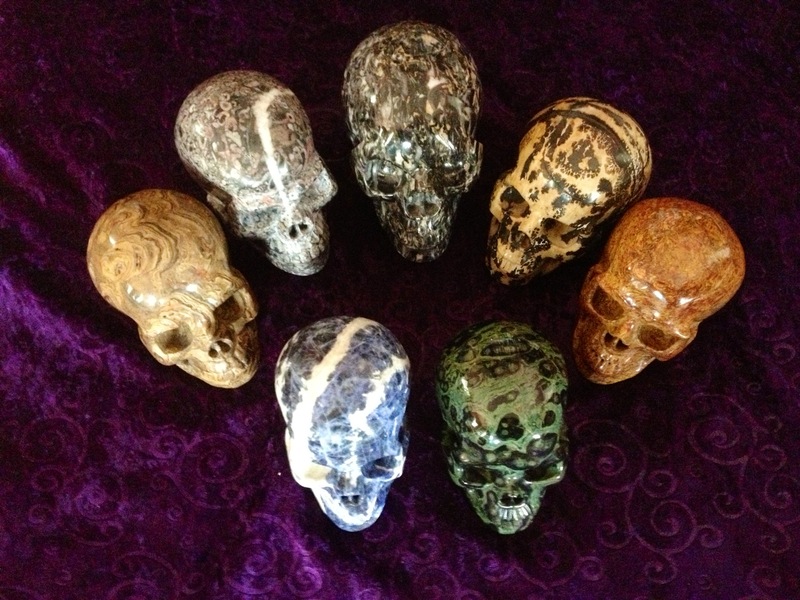 If anyone wishes to have a crystal skull reading with me, please contact me at soulsrvr@erols.com. I can do the reading in person, on the phone, or by Skype. The divination will generally follow the process described in the next-to-last paragraph. A typical session lasts one hour at a cost of $130.00. In that time, a person may ask for skull wisdom with two or three questions, each directed to a different skull or to the same skull. If the individual is contacting me through a phone call, I will send the individual pictures before the session of various skulls; the person may then choose which skull(s) he or she wants me to use. Bowen, Sandra, & F.R. ‘Nic’ Nocerino & Joshua Shapiro. (1988). Mysteries of the Crystal Skulls Revealed. Pacifica, CA. : J & S Aquarian Networking. Childress, David Hatcher, & Stephen S. Mehler. (2008). The Crystal Skulls:Astonishing Portals to Man’s Past. Kempton, IL. : Adventures Unlimited Press. Dorland, Frank. (1992). Holy Ice: Bridge to the Subconscious. St. Paul, Minnesota:Galde Press. Kaehr, Shelley. (2007). Crystal Skull Consciousness. Dallas, TX. : An Out of This World Production. Mercier, Patricia. (2011). Crystal Skulls & the Enigma of Time: A Spiritual Adventure into the Mayan World of Prophecy and Discovery. London: Watkins Publishing. Morton, Chris, & Ceri L. Morton. (1997, 1998, 2002). The Mystery of the Crystal Skulls: Unlocking the Secrets of the Past, Present, and Future. Rochester, VT.: Bear &Company. Murray, Kathleen. (1998). The Divine Spark of Creation: The Crystal Skull Speaks. Huntly, U.K.: Galactic Publications (Earth). Shapiro, Joshua, & Katrina Head (2012). Journeys with the Crystal Skull Explorers: Hidden Secrets of the Crystal Skulls. Ebook edition found on Amazon.com. Van Etten, Jaap. (2013). Crystal Skulls: Expand Your Consciousness. Flagstaff, AZ. : Light Technology Publishing. _________________. (2007). Crystal Skulls: Interacting With a Phenomenon. Flagstaff,AZ. : Light Technology Publishing. Webb-De Sisto, Marion. (2002). Crystal Skulls: Emissaries of Healing and Sacred Wisdom. Xlibris Corp.
Arceneaux, Leon M. (2005). The Crystal Skull: A Novel. Lincoln, NE. : iUniverse. Crichton, Michael. (1999). Timeline. New York: Ballantine Books. Harbinson, W.A. (1997). The Crystal Skulls. Custom Books Publishing. Morton, Chris, & Ceri L. Thomas. (2009). 2012: The Mystery of the Crystal Skulls. Visser, Jan. (2004). The Crystal Skulls. Childress, David H., & James, Ronald. (2008). The Search for the Crystal Skulls (75minutes). Adventures Unlimited Media. Merrell, Sherry W. (Caretaker of Synergy). (2009). Echoes From the Ages: Talking Story with Crystal Skulls (77 minutes). Avalon Video. Rosely, Steve. (2010). The Legend of the Crystal Skulls Remarkably Mystical & Healing (52 minutes). AVS Video Productions. Walsh, Jane M. (2008). The Legend of the Crystal Skulls: Ancient Mystical Artifacts or Ingenious Hoax? (46 minutes). Smithsonian Networks. Note: this film is hardly opento the mysteries of ancient crystal skulls.